Autumn is awesome here in Cornwall. Golden hedgerows, wild seas, cosy log fires… all amount to the perfect escape. Dramatic coastlines, hidden beaches and cobbled fishing villages are just some of the amazing things to explore. Cardinham Woods is magical all year round, but in autumn, it really comes into its own. The enchanting woodland walks meander round the river and dogs and children can run free in the woods. The Woods Cafe, Cardinham woods, Nr Bodmin, Cornwall is also a perfect place for a cosy lunch in front of the fire. The coastal path is a spectacular way of enjoying the amazing Cornish coast. The paths are well marked and take in some amazing sights and offer a brilliant way to enjoy Cornwall. Our favourites include Looe to Polperro, Lantic Bay and Hall Walk near Fowey. For the more adventurous, Adrenalin Quarry offers the perfect energy-fuelled day out. There you will find the UKs best zip wire, a giant swing, inflatable aqua park and coasteering. Its located near Menheniot in a flooded quarry and is a spectacular location which is full of fun. 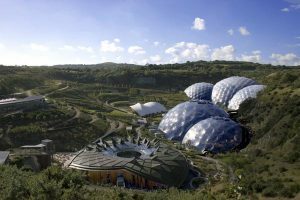 (locally known as Eden) is amazing at any time of the year, but this autumn, its the perfect place for a great day out. Arts festivals, Proud Eden, the Eden beer festival and Silent Disco yoga are just some of the treats in store over the next couple of months. And of course, it’s a lot quieter than at other times of the year.